Settle group expenses – made even better! In this update, we focused on making the billing for groups even easier. 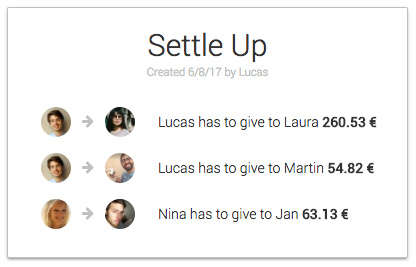 The new ‘Settle Up’ feature will simplify balances between multiple persons in a smart way and generate a final report of who owes what to whom. We also added support for currency conversion to our Android app. We strive to make your everyday life easier by simplifying the sharing of common expenses. Calculations – ain’t nobody got time for that! We recently added the stats feature to see what exactly your money was spent on. Many of you also wished for a feature to simplify the final balances in a group, for example, after a trip together with friends. When out and about with several friends, it can get very complicated in regards to who owes who what to whom. This will be simplified with the new feature ‘Settle Up’. The new feature reallocates the balances intelligently among group members to ensure that the least number of transactions are necessary to settle the score. If you were traveling and tabbed in a different currency, the amounts will automatically be converted to your standard currency. At the end, you will be able to easily see whom you still owe money to or who owes you money (see below). You can share this final report with everyone in the group through, for example, WhatsApp. Where do I find this new feature? Just go into your group and choose ‘Settle Up’ (find this item in the options menu in Android). How does this simplification work? Here’s an example: Let’s say, Laura owes Martin €15, while Martin owes Jana €15. In this case, Laura can give €15 directly to Jana. The number of transactions has been reduced from two (Laura → Martin, Martin → Jana) to one (Laura → Jana). The amount you owe or is owed to you doesn’t change – only the number of transactions. Wait, there is even more! While iOS users have already been enjoying this feature for a while now, we’ve finally added support for converting currencies to our Android app – yay! 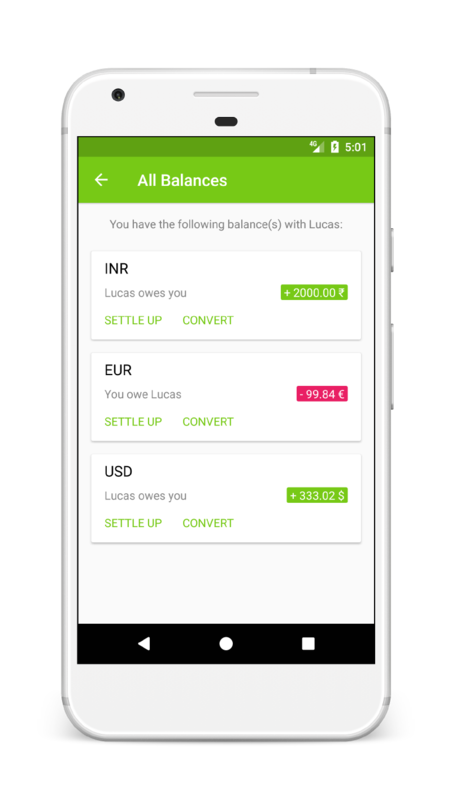 😊 To convert a balance to another currency, simply tap on the balance shown in the user details to get a complete list of all balances. Jan loves to build products and turn ideas into reality. He likes discussing digital trends and the impact of new technologies in the financial sector and enjoys cooking and good food.